Fibromyalgia is a chronic condition that causes life-disrupting symptoms like pain, fatigue, headaches, and sleep problems. It can be difficult to diagnose, in part because fibromyalgia symptoms are hard to distinguish from those of many other conditions. Doctors group fibromyalgia under the header of arthritis-type conditions, even though it does not damage the joints as arthritis does. 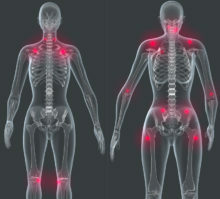 Yet joint pain, stiffness, and fatigue, which are all common with arthritis, are also hallmark fibromyalgia symptoms. Fibromyalgia pain may be at least in part due to problems with the brain?s ability to process pain signals. Sometimes a physical or emotional trauma, such as surgery, an accident, or the death of a loved one can set off fibromyalgia symptoms. The most notable fibromyalgia symptoms are pain and fatigue. To qualify as fibromyalgia, the pain must have lasted for at least three months, and be located in both the upper and lower body, as well as on both sides of the body. Fibromyalgia pain can be severe enough to interrupt sleep. People often report that they don?t feel well rested, even after a full night?s sleep. Rest may be further interrupted by conditions that often occur together with fibromyalgia, such as restless legs syndrome and sleep apnea. Other fibromyalgia symptoms affect mood and concentration. A condition nicknamed ?fibro fog? reflects the difficulty people with fibromyalgia often have focusing or completing tasks. More general issues, such as headaches, sensitivity to light and temperature, painful periods, and bowel problems also fall under the header of fibromyalgia symptoms. Fibromyalgia is a chronic condition, but it can be managed. Treatments are aimed at relieving pain and other fibromyalgia symptoms. Three medicines?duloxetine (Cymbalta), milnacipran (Savella), and pregabalin (Lyrica)?are specifically approved to treat fibromyalgia. Analgesic pain relievers and NSAIDs can also help with pain. Lifestyle measures such as reducing stress, exercising regularly, and eating a balanced diet can also improve quality of life with fibromyalgia. Fibromyalgia causes patients seemingly unexplainable pain that often prevents them from being able to work or pursue leisure activities. Research suggests that natural relaxation techniques play a key role in fibromyalgia pain management. Fibromyalgia is a perplexing condition. It causes severe aches and pains, and can affect sleep, mood and memory. There is no simple diagnostic test and no cure. And treatments that help control symptoms in one person may not work for another with the same condition. Q: Two of my close relatives have died of Alzheimer’s disease. Am I at higher risk for the condition because I have family members who had it? A: The majority of cases of Alzheimer’s disease (AD) appear to be the result of a complex interaction between genetic influences and other risk factors. Q: I recently found out a friend was diagnosed with bipolar disorder? She said she has periods of hypomania, along with depressive episodes. What’s the difference between mania and hypomania? A new study indicates that fibromyalgia patients can fall on a spectrum driven by the peripheral nervous system on one end and the central nervous system on the other. Fibromyalgia is a relatively new disease: It wasn’t until 1981 that the first controlled study to identify symptoms of fibromyalgia was published. And it wasn’t until 2005 that the American Pain Society issued the first treatment guidelines for fibromyalgia.